I recently realized that my Asus RT-N66U wasn’t routing at the speed it should have been when running the Tomato firmware. Apparently this is because Tomato disables (or rather, doesn’t enable) the hardware acceleration for NAT traffic. So, I started looking at a replacement router. At first I was looking at a Routerboard from Mikrotik, but a friend steered me toward the Ubiquiti Edgerouter products. 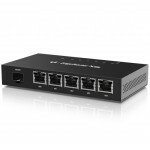 The Edgerouter Lite is a pretty popular product for Sys Admins and network engineers home networks, but Ubiquiti recently released the Edgerouter X series. They’re the same OS, just slightly more consumer based hardware (no hardware acceleration, faster processor, but less RAM/Flash, and more ports). The stock X was nice, but the SFP version really caught my eye because it had Passive POE on all ports, and supported a single SFP module (which I could throw a copper module in and use for uplink to my cable modem). Amazon had them for $79 with Prime, so I ordered one and waited anxiously for it to show up. The router showed up, and first impression was it was small! It’s the size of an 8 port home switch. All metal enclosure, very basic lights. The power supply is almost as big as the router! It comes with a 24V 3.5A power supply to support using POE on the ports. If I didn’t plan to use POE, I’d probably use a smaller power supply (it supports a wide range of power supplies). The setup is quite easy, and if you follow the quickstart guide, it gets you going with a single WAN, and 4 (or 5) port WAN. I had a spare copper SFP module, so I set the WAN port to eth5, and then the rest for LAN. Once that was done, a reboot happens, and you can start configuring everything else (port forwarding, DHCP leases, DNS, etc). DHCP was easy (albeit time consuming), and port forwarding was really easy (I don’t forward many ports). I did have to do some extra to get local DNS to work with DHCP assignments, and to get DHCPv6-PD working with Comcast (required a reboot after the configuration). I’ve linked those articles. Those are the biggest hurdles I had with configuration to make it more like a normal home router. I didn’t want to set up a local DNS server again, as I’m trying to cut down on my power usage1). While the GUI is very serviceable at this point, you will want to get used to using the console for configuration. Some stuff just can’t be done through the GUI, and ultimately, this is a relatively serious piece of network gear. I actually like that because my enterprise networking experience is relatively low. So having this at home should give me some of that experience. No, it’s not Cisco’s IOS, or Juniper’s JUNOS, but it is what is considered enterprise grade. It, together with their wireless gear, is very capable. All and all, I’m extremely happy with the router. It should be able to route my internet connection well into the 750Mbit/sec level. And since I’m currently sitting at 150Mbit down, and 20Mbit up, I think I’ve got some wiggle room. And Ubiquiti has indicated there is some hardware acceleration available on the processor, they just haven’t figured out if they can leverage it yet, and to what level.